Sleeps 5 adults + 4 kids. 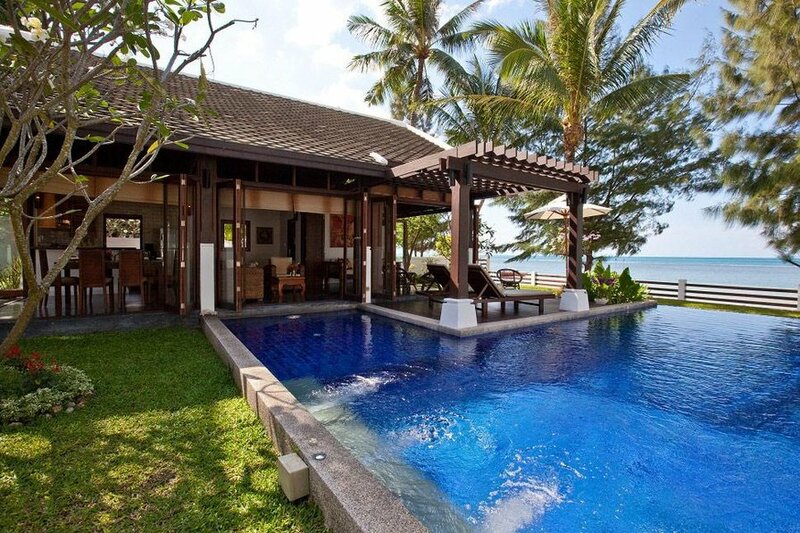 Our 4-bedroom luxury villa with private pool, lovely garden, internet access, satellite TV, and air conditioning is situated on pristine Laem Noi beach in the tranquil North-West of Samui. Several fantastic seafood restaurants are within a 10-minute walk from the villa. Numerous spas are found nearby. The nearest town, Nathon, is a 10-minute drive away, and there you find an international supermarket (Tesco), pharmacies, and shops of all kinds. Being located directly on a quiet beach, our villa is perfect for both family holidays as well as romantic escapes. The property comprises of two buildings. The main villa houses three bedrooms: two en-suite doubles and one bunk-bed room for up to four children. This villa also features a living area with a large flat-screen TV (English movie channels available) and DVD-player. Both large en-suite bathrooms feature walk-in showers and twin chrome sinks, one bathroom also has a Jacuzzi tub. The second villa features a fully fitted kitchen as well as dining and living areas, all under a five-meter-high vaulted roof. The sliding windows can be fully opened on three sides, creating a very Thai atmosphere. The beach-facing side of the villa can be closed off by interior sliding doors for privacy – with its daybed, this room can serve as an additional single bedroom, with a full bathroom right next to it. Just outside is a shady terrace with sun loungers, from which you can jump directly into the private blue-tiled pool. This is a very tidy and well-presented property with the added practicality of the children’s room and bunk-beds. This, together with the large garden, makes it an ideal and flexible property for families. Our property is managed by a highly efficient British couple, who will go to great lengths to ensure your stay will be nothing short of spectacular. Linens and towels changed twice weekly, property is cleaned weekly. Upon request, in-house massages and a private chef can be arranged (additional charges apply). Please note that the maximum number of adults is FIVE, the bunk beds are NOT suitable for adults. NO EXCEPTIONS!